If you are newly engaged and considering a Caribbean wedding then you have come to the right place. CaribbeanWeddings.com has been in business as an independent company since 1999 however, our owners have been involved in the Caribbean since 1978. We have traveled to most of the islands including Jamaica, Aruba, Curacao, The Bahamas, Mexico and just about everywhere in between. We are based in Florida and also promote weddings in what we call "Florida's Caribbean". If you have ever visited places like Islamorada, Key West, Miami Beach, Ft. Lauderdale Beach you will know that Florida like the Caribbean has much beauty to offer. There are also beautiful islands on the West Coast of Florida that are very Caribbean and some of these are Sanibel Island, Captiva, and St. Anne's island. And if you look at upstate Florida you have beautiful beaches on the Gulf Coast and the East Coast. A Caribbean wedding should be all about relaxation and enjoyment in a stress-free environment. Many of our wedding couples prefer to wear more casual attire and some prefer to wear formal attire. Whichever you choose, know that we are the Caribbean wedding experts that can help you plan the perfect day. Our wedding specialists provide ample details on getting married in the Caribbean and offer a vast range of wedding packages in the Caribbean. There are many different variables that we take into account when we suggest Caribbean wedding destinations and resorts. If you are planning on inviting guests, one of the key factors to consider is the availability and cost of your air connections. You also want to factor in the time it takes to reach your destination. Many couples are looking for activities for their guests. When we know what it is you are looking for we might recommend an island with a resort that is within walking distance to restaurants, cafes and shops. This way your guests will be able to choose what they want to do, eat and spend. Other couples prefer to stay at an all-inclusive resort. There are advantages and disadvantages to this as well. For some guests the all-inclusive resort might be too pricey and therefore will discourage guests' attendance. Many people will have children attending their wedding. In the Caribbean there are resorts that are adults only and some that are kid friendly. In Mexico you can stay at an adults only resort and your guests can stay at a resort nearby that is kid friendly. 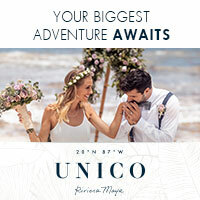 There are so many choices and so many wonderful places in the Caribbean, and it is our job to make sure we assist you in planning the perfect wedding for you. After all, this is the most important day of your new life and a Caribbean wedding should be something very special. Contact Caribbean Weddings today for any inquiries.